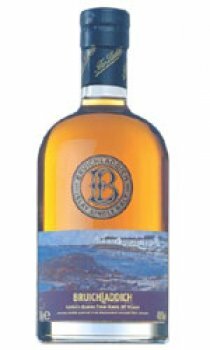 Bruichladdich legacy series is the second release of their oldest and best casks which were inherited when they bought the distlilery in Decmber 2000. The image on the tin and label is entiltled 'Loch Indaal from Port Charlotte' was painted by the celebrated artist, Frances McDonald, whose work mainly depicts the scenery of Scotland's Hebridean Islands. Jim McKewan, the Master Distiller has made this persoanl selection of casks dating from 1965 and has carefully vatted them together to create an exceptional limited edition. Cask - 50% American Oak 50% Refill Sherry. Colour - Warm amber, harvest honey gold. Body - The luscious silky smooth supple texture caresses the palate. It's full and focussed and requires lots of aeration time. Nose - An explosion of fruit unbelievable for a spirit of this age. The aromas have moulded beautifully together over the long maturation. Palate - A truly delicious liquid satin mouth feel. The sweetness of the oak vanilla tingles the toungue keeping the fruits in check, but only for a little while, then they too join the party. Creamy and delectable, with just a hint of lemon to remind us of its Island location. Finish - Extended aftertaste that seems to go on into the sunset.